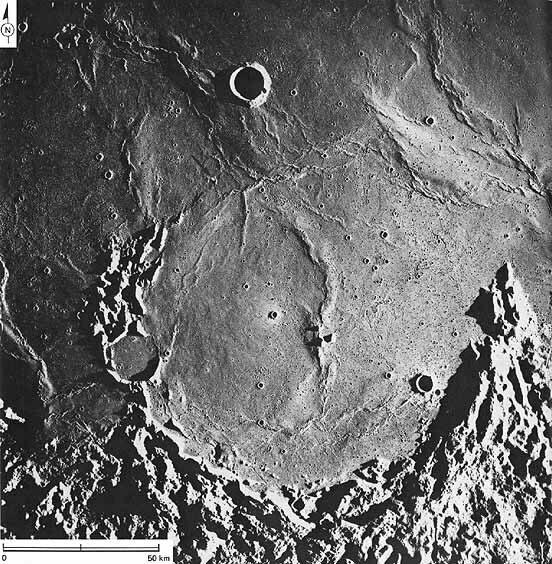 FIGURE 167 [below].-Theophilus is older than King, Copernicus, and Aristarchus, and many of its original features are more subdued than are those of the younger craters. Here on the north rim, the entire width of the Theophilus ejecta blanket can be seen, and irregular-appearing secondary impact craters are visible beyond the blanket at the top of the picture. In the middle of the scene, smooth material occurs in pools on top of the ejecta blanket. Smaller pools of similar material are present on the terraces in the wall of Theophilus. D. J. Milton (1968) originally discovered this pooled material in the mid-1960's from telescopic studies and suggested that it might be volcanic. This Apollo 16 view shows that the pools are very similar to, but more degraded than those on the rims of King (figs. 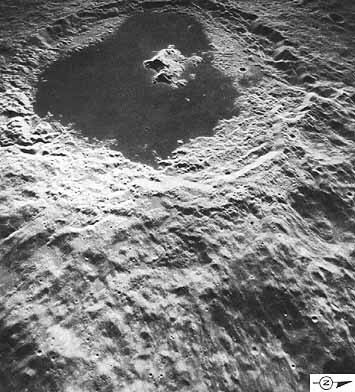 149 and 155 to 158) and other fresh craters such as Tycho and Copernicus. This similarity suggests that the pool material may be rock melted by the Theophilus impact.-K.A.H. FIGURE 168 [above].-A detailed view of part of the central peak complex of Theophilus. 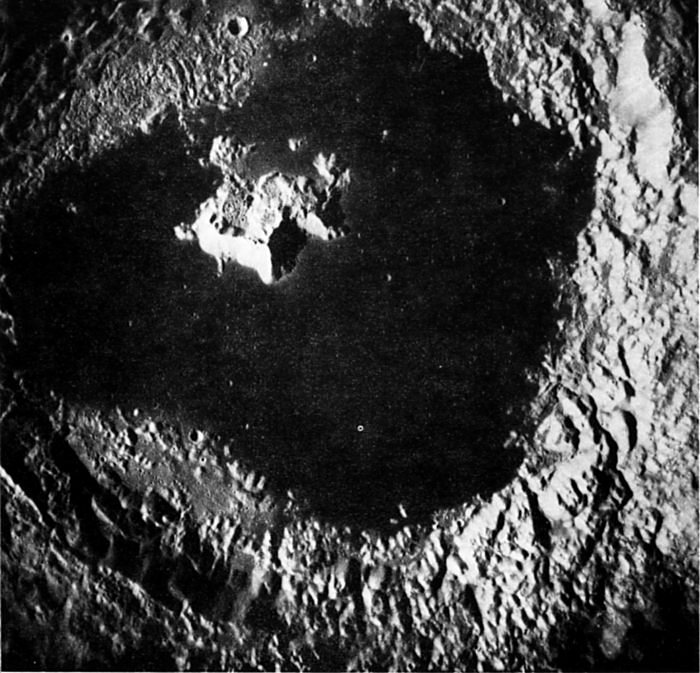 Central peaks are typical of most young, large impact craters on the Moon-and also of many manmade craters on Earth. From experimental data using controlled explosions, central peaks are known to consist of bedrock originally lying below the crater floor that, during the explosion, was uplifted, faulted, and folded by shock wave action. The irregular light-toned mountainous mass projecting above the floor of Theophilus is split into at least three enormous blocks separated by V-shaped structural valleys. 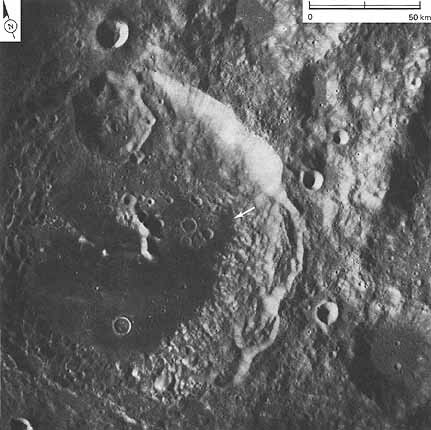 Four or five circular craters without a prominent raised rim are located near or at the bases of the steep slopes. If these craters are endogenic vents rather than impact craters, their presence further suggests structural control along major fault planes. The planar walls of the northwest-trending valley contrast with other sloping surfaces of the central peak complex. They are steeper and, except for a few outcrops of protruding bedrock, are marked by linear grooves not unlike slickensides on many fault planes on Earth. Rock chutes do not seem to be a likely explanation for the grooves because there are no talus deposits or blocks at their lower ends. The debris cover is thin enough along the southern valley wall (top of picture) to show that the southern mountain block consists of layered rocks-at least five thick, light-toned layers alternate with thin, dark layers.-M.J.G. 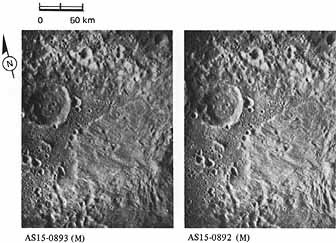 FIGURE 169 [left].-The preceding pictures of large craters were all taken under low Sun conditions. This picture of Langrenus, a large crater near the east limb, was taken when the Sun angle was 71°. The high Sun angle emphasizes the brightness of the steep slopes in the walls and central peak complex. Like the other craters, Langrenus has an irregular rim crest, its walls are thoroughly terraced, and the floor surrounding the central peaks is level but very rough. Langrenus is about 130 km in diameter.-G.G.S. FIGURE 170 [left].-Tsiolkovsky is one of the most prominent features on the far side of the Moon. It is a 1 90-km- wide impact crater with a large, complex central peak that is offset from the apparent center of the crater. 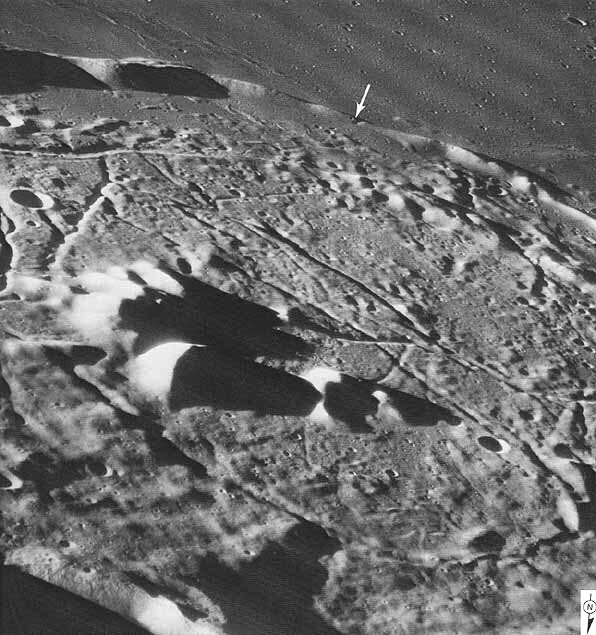 Differences in tone and texture between the central peak, the lava-flooded floor, the terraced walls, and the ejecta blanket are dramatically displayed in this oblique view. The ejecta blanket is dominated by a coarse pattern of ridges radiating outward from the crater; superposed on this pattern are many small level pools of smooth material that are much lighter than the otherwise similar smooth dark mare in the floor of Tsiolkovsky. The pools probably originated differently. They may consist of rock that was melted by the heat and pressure generated during the impact event and that flowed into depressions before it hardened. Cratering experiments on Earth have shown that central peaks consist of bedrock that has been displaced upward by a distance equal to about one-tenth the diameter of the resulting crater. 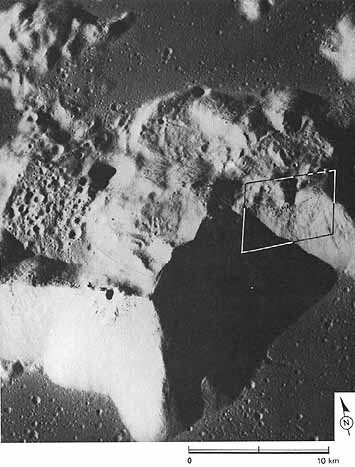 If samples could be obtained from the central peak at Tsiolkovsky, they might be rocks that were 20 km below the Moon's surface before Tsiolkovsky was created. -H.M. FIGURE 171 [above].-This is clearly not another view of Tsiolkovsky, but there are some remarkable similarities between this picture and figure 170. 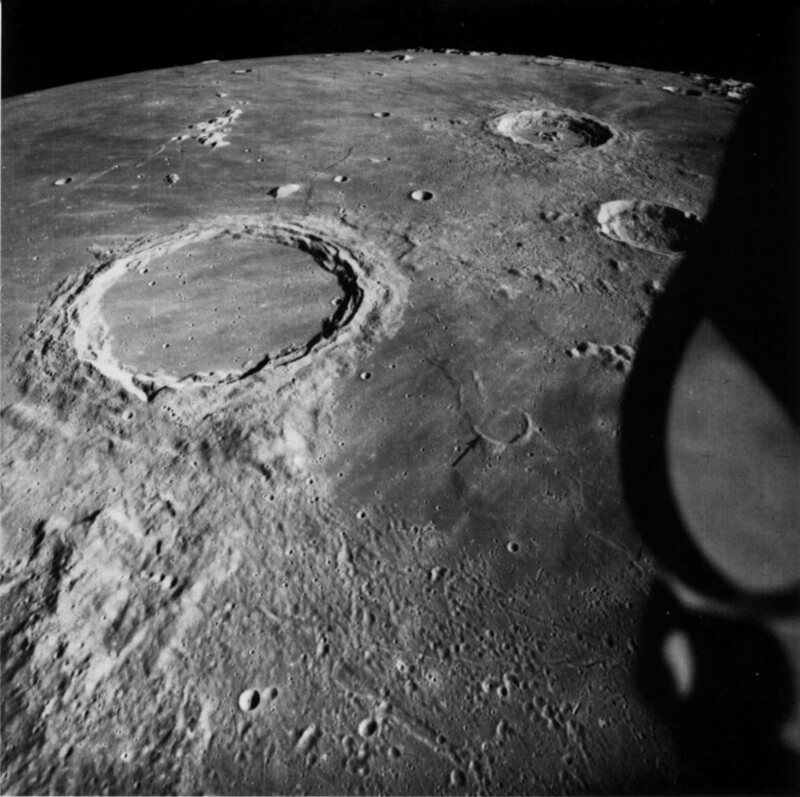 Some of the similarities, such as viewing angle and Sun direction, resulted from screening many pictures of the same crater to duplicate viewing conditions. 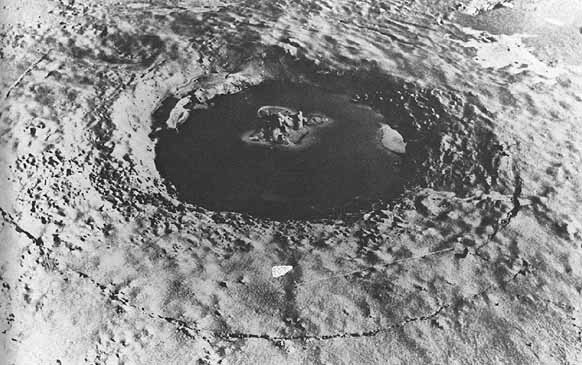 Other similarities are inherent in the crater-forming process. The crater above is about 100 m in diameter and 6.5 m deep. It has been intensively studied by D. J. Roddy (1968), U.S. Geological Survey, who provided the picture. It was produced in the plains of western Canada by the Canadian Defence Research Establishment as a cratering experiment. The explosive charge was a 450-Mg hemisphere of TNT resting on the ground. The site is underlain by alluvial and fluvial deposits of interlayered finegrained silt, sand, and gravel, much of which were below the local water table. The smooth, dark "floor" of the crater is water that flooded the crater immediately after it was excavated. Similarities between the two craters include (1) complex central peaks of uplifted rock material, (2) complexly terraced walls caused by slumping along concentric faults, (3) irregular but approximately circular raised rim crests, and (4) continuous blankets of hummocky ejecta, both of which are dominated by radial depositional patterns. An obvious difference is the thin, dark, arcuate line in the near field of this picture. It is part of a zone of circumferential fractures extending around the crater. 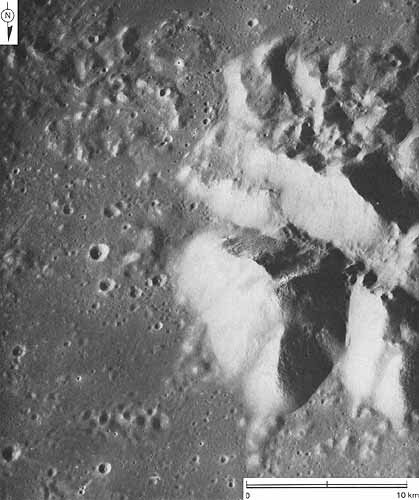 Similar fracture zones may be present around lunar craters, but, if so, they are much less obvious.-G.W.C. FIGURE 172 [left].-This vertical view shows the central part of Tsiolkovsky in more detail. From the nature of the boundary between the dark mare lavas and the lighter materials at the base of the walls and in the central peak, we know that the lavas must have lapped upon and embayed the lighter materials. The relatively level areas of lighter material in the southwest and northwest parts of the floor have a distinctly different texture than the coarse blocky materials of slumped wall that surround the floor elsewhere. Finely cracked, furrowed, and hummocky, they closely resemble parts of the floor of the crater King (figs. 151 to 154). They probably consist of impact melt that solidified to form the original floor of Tsiolkovsky before it was flooded by mare lavas. -G.W.C. FIGURE 173 [left].-Moderate enlargement of part of a panoramic camera frame provides greater detail of the central peak complex of Tsiolkovsky. 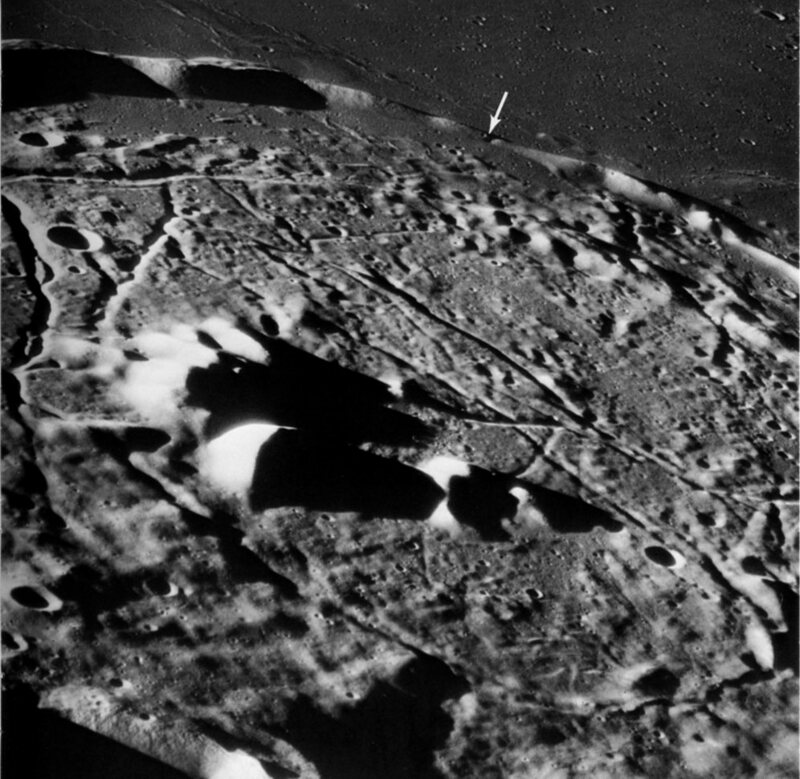 A relatively large population of superposed craters has been preserved on level areas of the peaks (near the left-center of the photograph). In contrast, very few craters are present on steep slopes-most have been destroyed by the downslope movement of erosional debris. 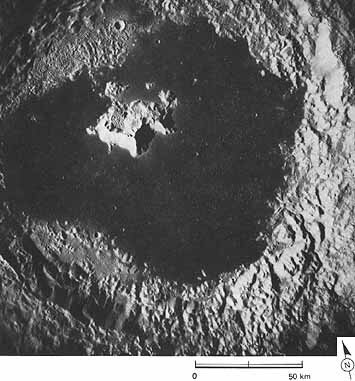 An intermediate population of craters on the dark mare shows that the mare surface is younger than the level areas of the peak complex but older than the freshly exposed steep slopes of the peaks. The youngest part of the mare surface is the dark, smooth area adjacent to the small angular rifle in the upper left corner. Here small craters have been almost completely filled by the flow and are barely discernible. The rifle may have served as the vent for the young lavas.-M.W. FIGURE 174 [above].-Drastic enlargement of a panoramic camera frame provides a wealth of detail within the small area outlined in figure 172. Note the many large blocks on the slope. The largest block is about 125 m wide. Most blocks apparently originated at the discontinuous ledge near the top of the slope. Note also the fillets on the upslope side of many of the blocks. They probably consist of fine-grained debris that was trapped behind the blocks as it moved downslope. 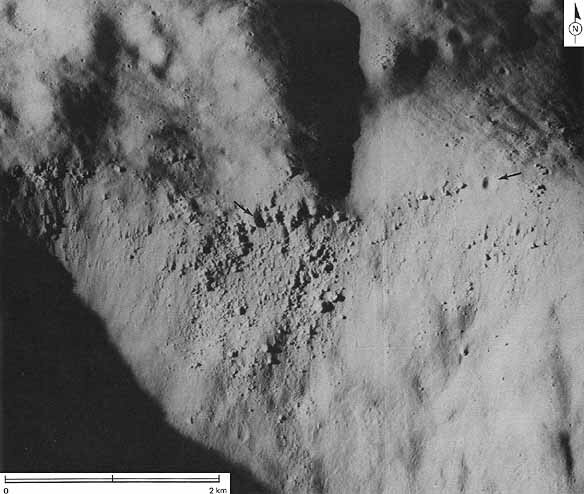 The arrows identify what appear to be two craters in the process of being destroyed by erosion. Otherwise, craters are absent on the steeply dipping slope, although numerous craters are present on the gentler slopes above.-M.W. 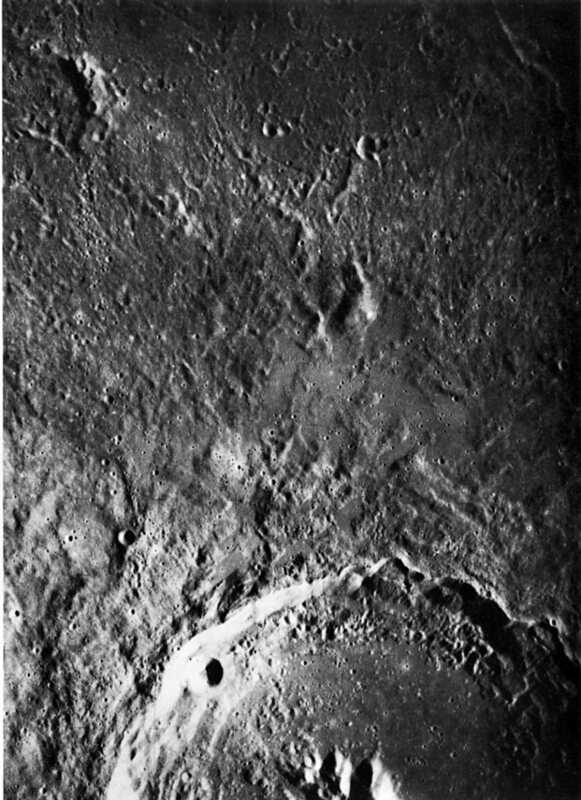 FIGURE 175 [above].-This apronlike expanse of striated material on the northwest flank of Tsiolkovsky is interpreted as a giant landslide. In some respects it resembles terrestrial landslide deposits. A good example is the Sherman landslide in Alaska, which was triggered by the "Good Friday" earthquake in 1964 and which covers part of the Sherman glacier. The striations apparently outline individual filaments or jets of debris like those that have been observed in experiments involving the flow of particulate matter traveling at high velocity. The flow originated at the west-facing scarp marked by an arrow. 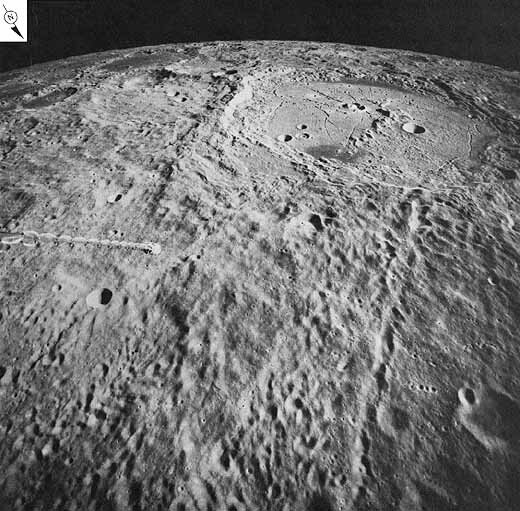 From the scarp on Tsiolkovsky's rim to the floor of the ancient crater Fermi, where the landslide came to rest, the difference in elevation is about 3000 m. The maximum distance of travel was about 50 km.-H.M. FIGURE 176 [left].-The setting of the landslide is much more evident in this stereogram provided by L. J. Kosofsky. Here it is evident that the northwest rim of Tsiolkovsky is appreciably higher than the area where the landslide came to rest. The northern wall of Fermi is clearly recognizable as the very rugged south-facing slope near and parallel to the top edge of the stereogram. To those without prior knowledge of the area, Fermi's wall probably was not evident in monoscopic figure 175.-G.W.C. 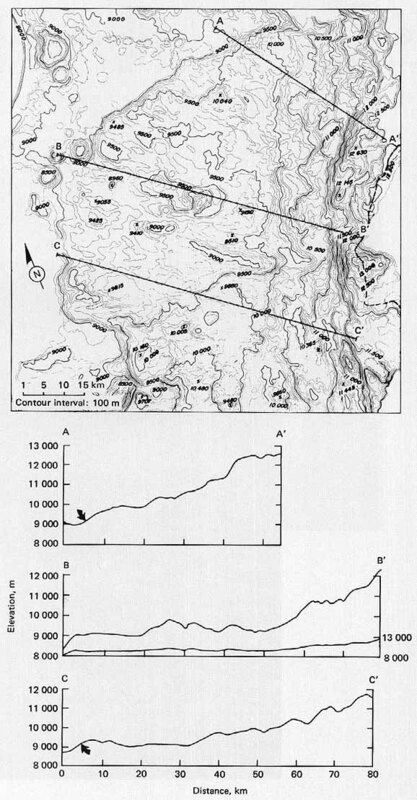 FIGURE 177 [right].-This topographic contour map (Wu et al., 1972) was compiled from two mapping camera pictures like those in figure 176. For easier reference part of the rim crest of Tsiolkovsky has been marked with a heavy dashed line. From this map the area, the slope, and (after making some assumptions) even the volume of the landslide can be measured. The heavy straight lines across the slide locate the three topographic profiles shown below the map. Profiles are another method of portraying topographic information. On two of the profiles the lower edge or toe of the landslide has been marked with an arrow. 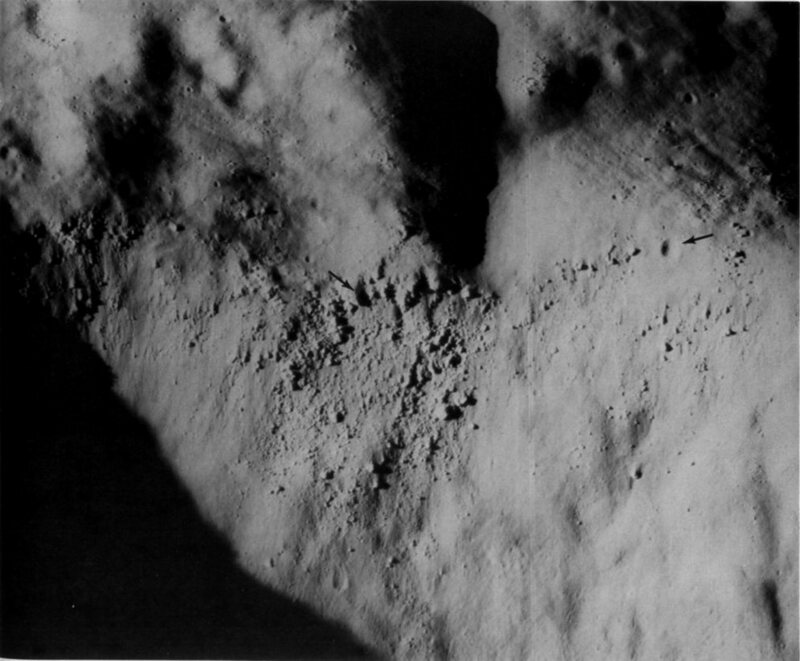 (On the third, the lower edge has been destroyed by an impact crater.) Because the landslide is topographically a rather subtle feature, the vertical scale of the profiles has been exaggerated by a factor of 5 to show the configuration of the slide more clearly. However, for comparison, one of the profiles has also been drawn without vertical exaggeration .-G.W.C. 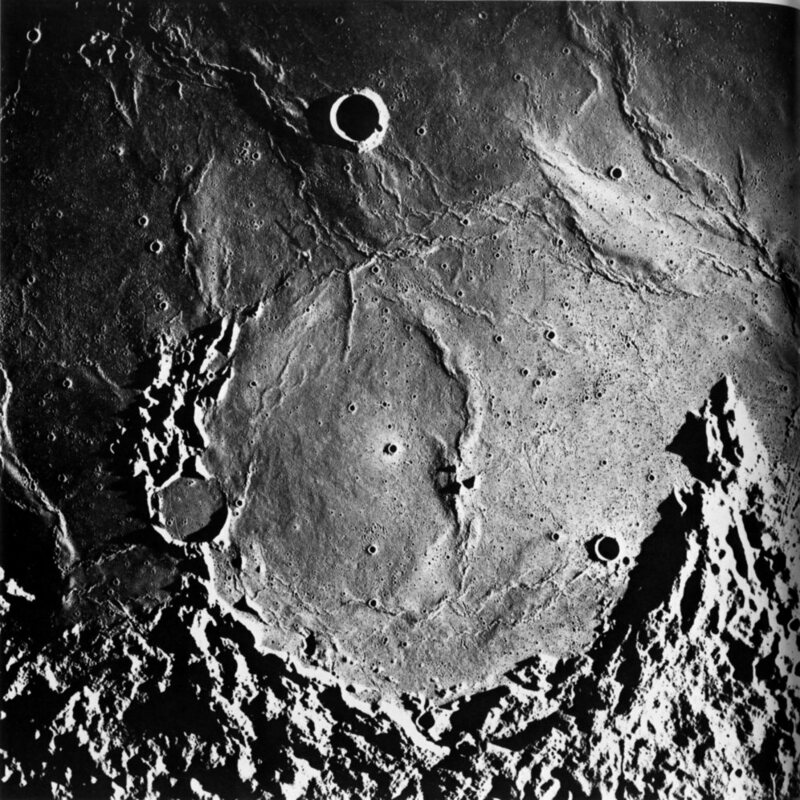 FIGURE 178 [below].-Aitken is a large crater (145 km in diameter) on the far side. Like many other large, young craters it has an outer field of secondary crater clusters and chains, an extensive inner blanket of bright ejecta, bright and rugged walls, a flat floor partly occupied by dark mare material, and a central peak complex. However, in several respects Aitken differs from other craters of comparable age and size. Its central peak has an unusual subcircular pattern, its rim crest is complexly crenulated, and its walls are best described as jumbled (El-Baz, 1973a) rather than terraced. The last two characteristics may have been caused by the shock associated with the formation of the large crater (30-km-diameter) on Aitken's north wall. The shock may well have destroyed the preexisting terraces and caused the additional slumping that gives the rim crest its crenulated appearance. Many interesting features are visible on Aitken's floor. Among them are some unusual ridges (arrow), which were described earlier (fig. 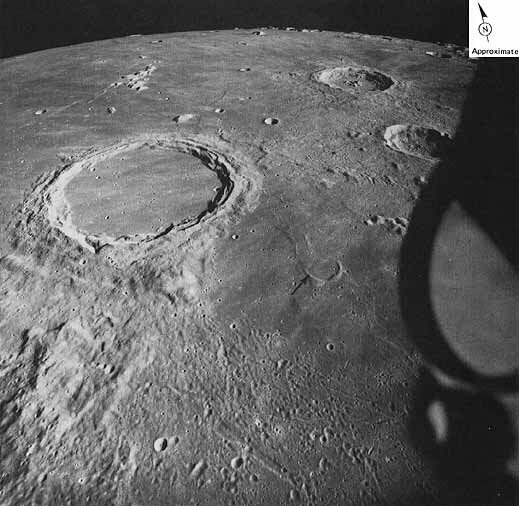 84), and several very unusual craters or depressions, some of which may be the sources of the mare fill (El-Baz, 1973a).-G.W.C. 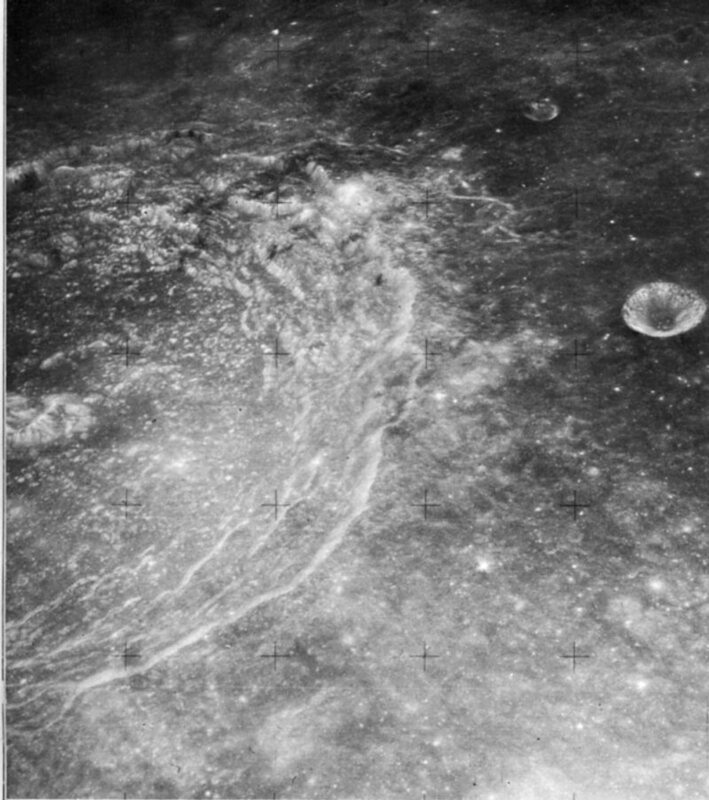 FIGURE 179 [above].-The ejecta blanket and secondary impact craters of the mare-filled crater Archimedes (80 km in diameter) are visible on the terrain toward the viewer (south) but not on the mare surface to the crater's left and right. Yet at one time ejecta like that to the south must have completely surrounded Archimedes because similar ejecta surrounds craters such as Aristillus (upper right). Thus, the mare lavas, in addition to filling the interior of Archimedes, obviously have covered the eastern and western parts of the ejecta. In turn, ejecta from Archimedes has covered materials of the Imbrium basin like the rugged hills in the lower left of the picture. These stratigraphic relations prove that time elapsed between formation of the Imbrium basin and its filling by mare-time enough for impacts to create Archimedes, the deeply flooded crater to its right (arrow), and similar "Imbrian-age" craters elsewhere, as was pointed out by Eugene Shoemaker in 1962. 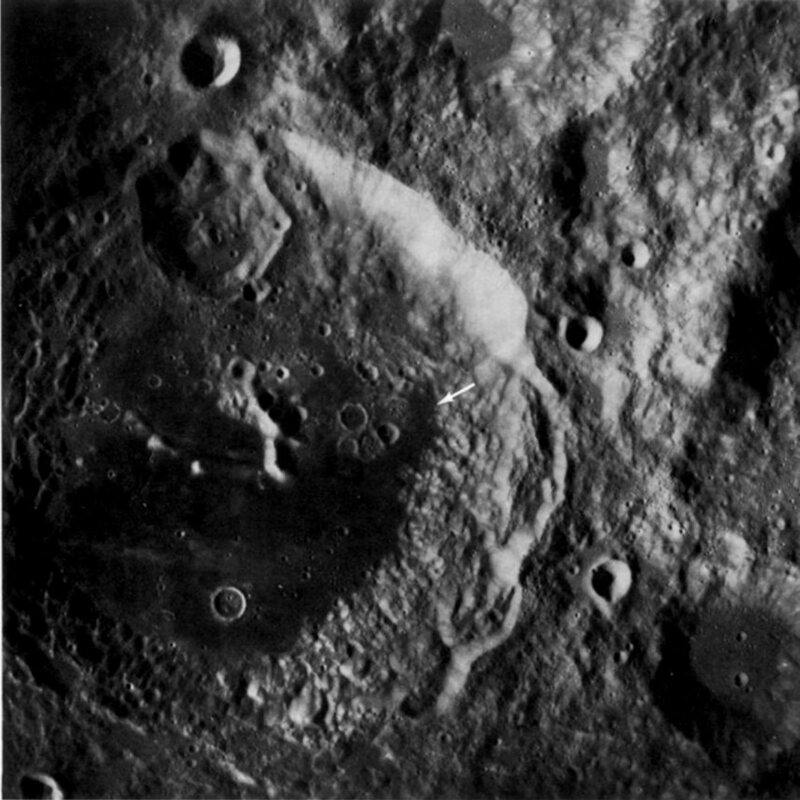 Archimedes is the first large crater described in this chapter that has no visible central peak complex. Presumably the complex exists but has been completely inundated by the mare.-D.E.W. 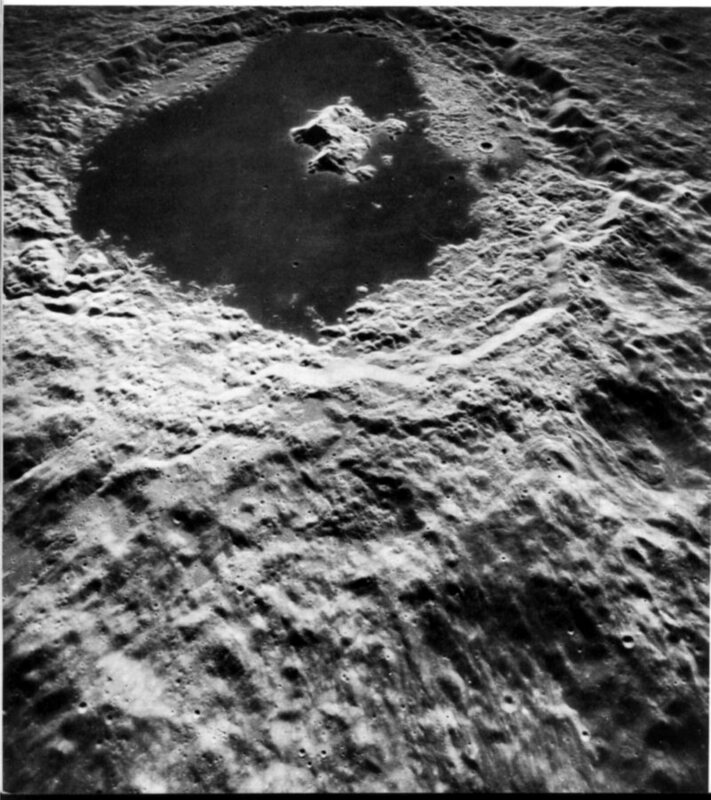 FIGURE 180 [above].-The crater Humboldt, on the east limb of the Moon, as seen from Earth, is 200 km across, a little larger than Tsiolkovsky. This view by the Apollo 15 mapping camera looks southward across Humboldt's ejecta blanket and into the crater. 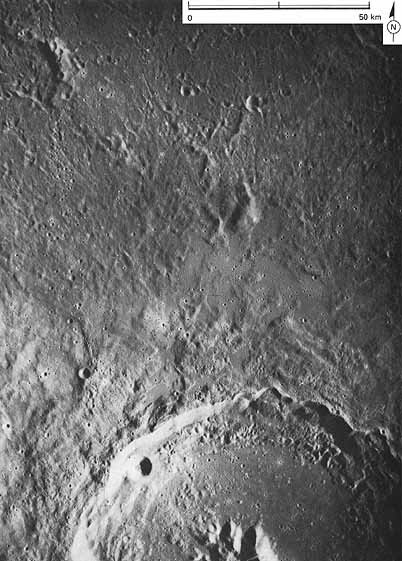 Irregular secondary craters partly covered by the ejecta are in the foreground, and a long chain of secondaries extends from Humboldt's rim to the foreground. 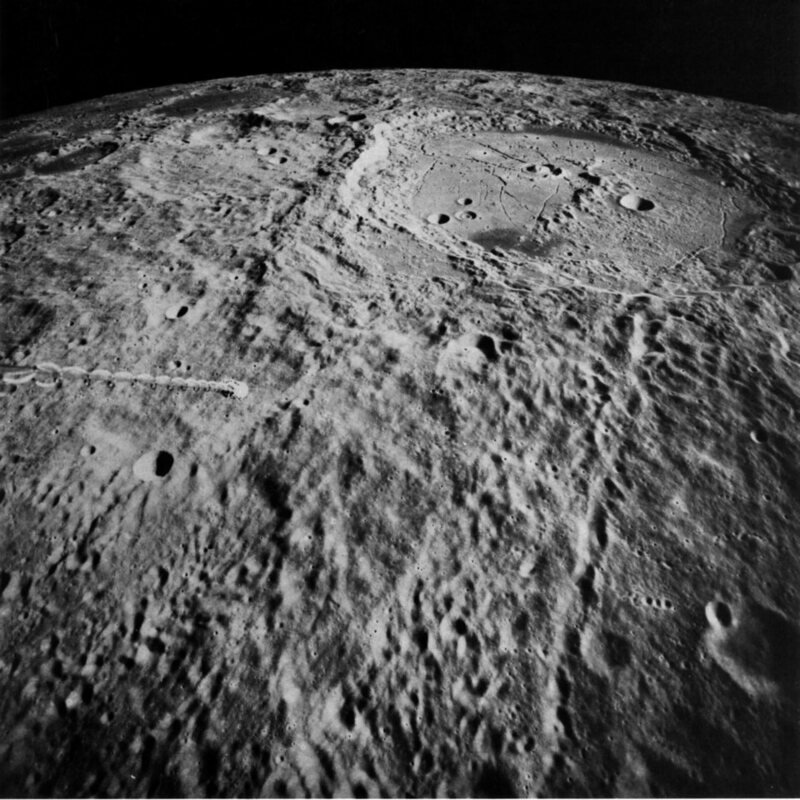 Humboldt is one of the largest craters known to have a prominent central peak. If the crater is like terrestrial impact structures, the peak may expose rock uplifted about 10 percent of the crater's width, on the order of 20 km from beneath the crater floor. This would be an exciting find for future astronauts. 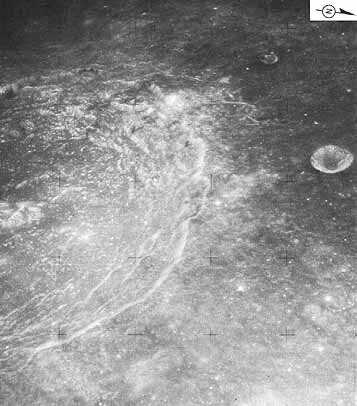 A spider web of cracks on the crater floor suggested to R. B. Baldwin (1968) that the floor was bowed up in the middle. Later, dark mare lavas flooded low areas in the outer part of the floor and covered the cracks. A peculiar "bull's eye" double crater on the crater floor has several counterparts elsewhere on the Moon. The origin of these double craters is a continuing puzzle.-K.A.H. 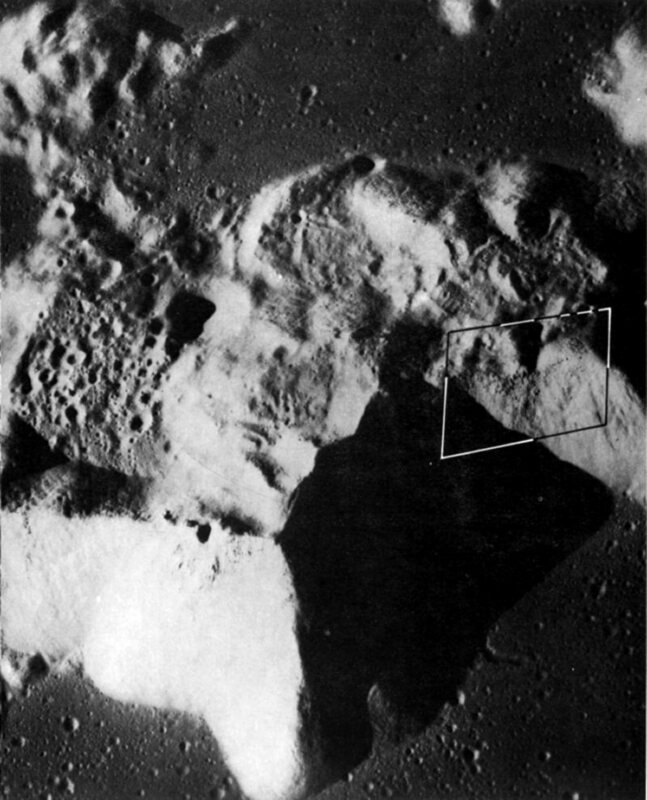 FIGURE 181 [below].-This view into the shallow crater Gassendi shows another strongly fractured crater floor. Gassendi is about 110 km wide. Dark mare lavas in the distance embay the rim and a little of the interior of Gassendi. They may have entered the crater through the narrow gap partly in shadow below the arrow. Most craters that have fractured floors are near areas of mare flooding. This suggests that the fracturing is a consequence of volcanic activity. 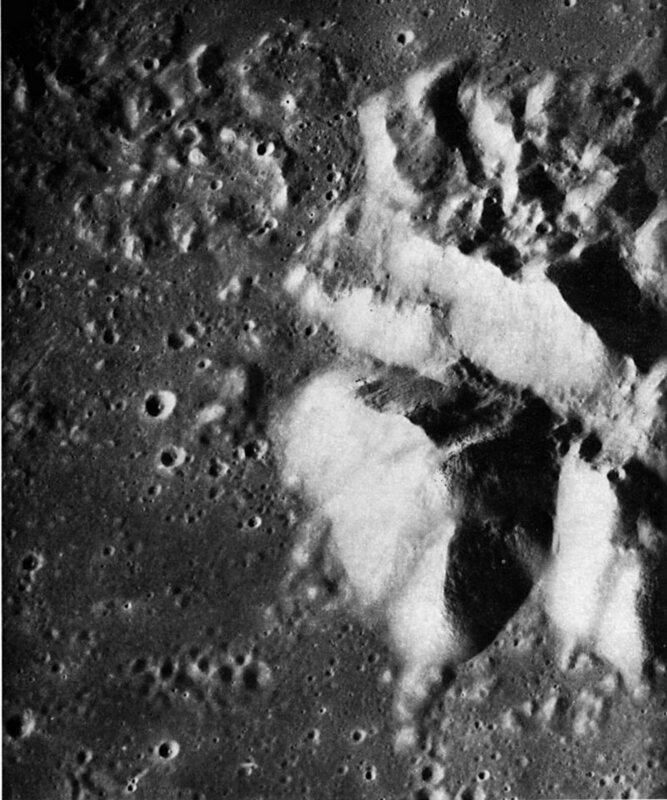 An area next to the central peaks of Gassendi was the runnerup choice for a landing site for Apollo 17.-K.A.H. FIGURE 182 [below].-This arcuate structure is Letronne. It straddles the boundary between southern Oceanus Procellarum and the southern highlands. From "horn to horn" it is about 115 km wide. Astronomers have long recognized Letronne as a crater and geologists also interpret it as a crater because those parts preserved have much in common with better-preserved craters. The preserved crater elements include a large segment of a raised rim, a partly preserved blanket of ejecta occupying depressions along the lower edge of the picture, and the tips of three centrally located peaks that presumably represent the top of a buried central peak complex. The largest and steepest slopes along the rim face inward and probably define the wall of Letronne. The northern one-third of the rim and wall has been almost completely buried by the mare lavas of Oceanus Procellarum. An isolated small hill (arrow) and the crudely arcuate band of mare ridges east of the hill mark the approximate position of the buried rim. The abrupt disappearance of the rim beneath Oceanus Procellarum suggests faulting, but vertical movement without faulting is also possible; this part of Procellarum may have been tilted downward or the adjacent highlands upward.-G.W.C. 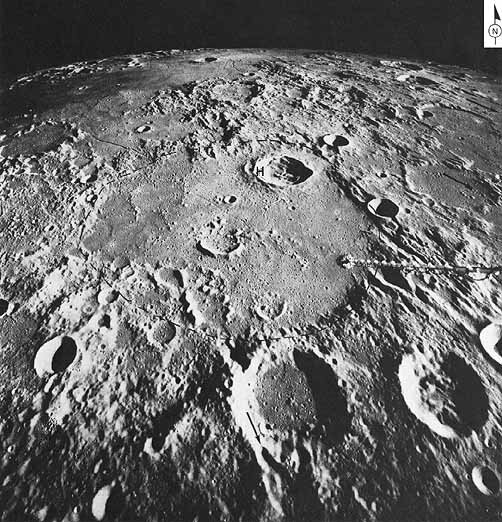 FIGURE 183 [above].-The very old crater Hipparchus has been nearly obliterated during eons of lunar change. 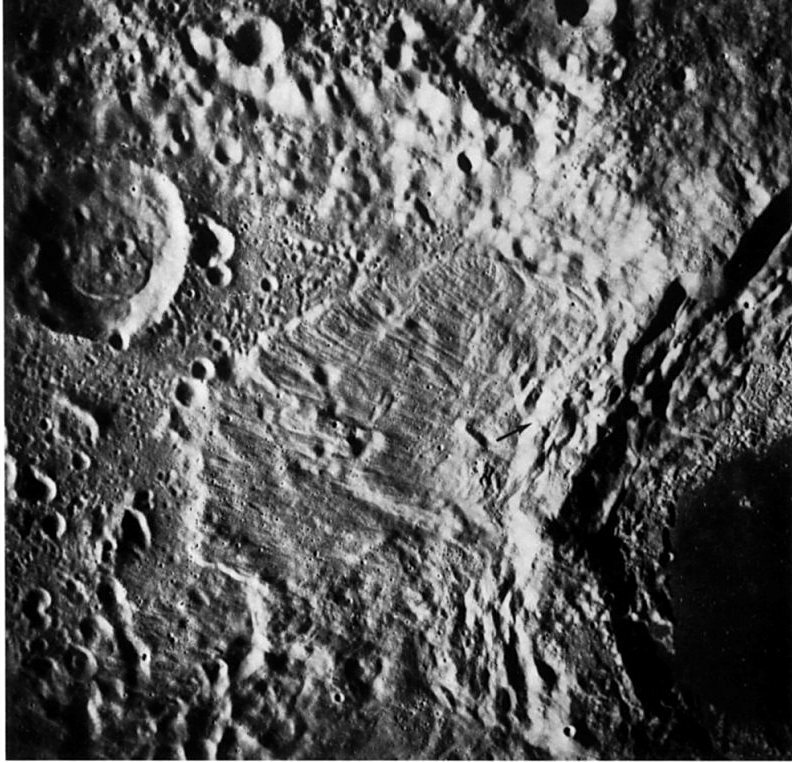 Except for the circular pattern of subdued mountains (dashed line) that surround most of it, Hipparchus would not be recognizable. It is about 150 km wide. Beyond it near the horizon at the left is Sinus Medii, the smooth dark- surfaced area that lies at the center of the Moon when seen from Earth. Part of the rim of Hipparchus is modified by "Imbrium sculpture," the pattern of ridges and grooves radial to Mare Imbrium, which affects the lunar surface for more than 1000 km from Imbrium. The four arrows show how the pattern radiates outward across this part of the Moon. 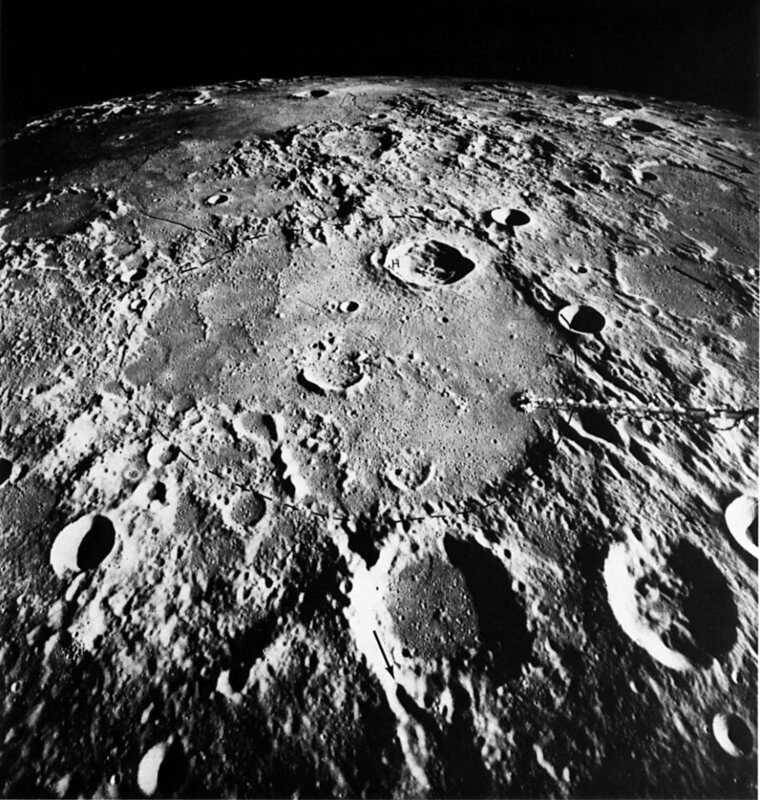 (The Imbrium basin lies beyond the left horizon.) 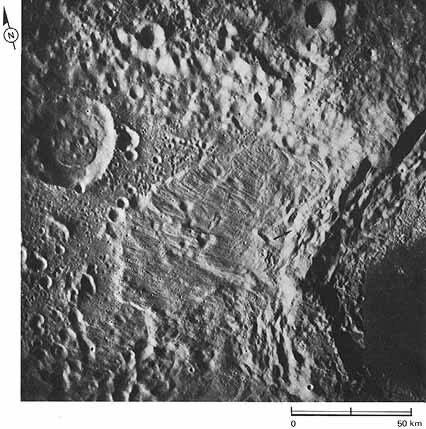 Craters and hills have been formed in the floor of Hipparchus and subsequently have been partially inundated by marelike plains deposits. The ejecta blanket of the much younger crater Horrocks (identified by H) is, in turn, spread over the marelike filling.-M.C.M.